Study after study shows how much the younger generations and especially Millennials care about making a difference in the world. How should businesses leverage this deep interest to yield competitive advantage. 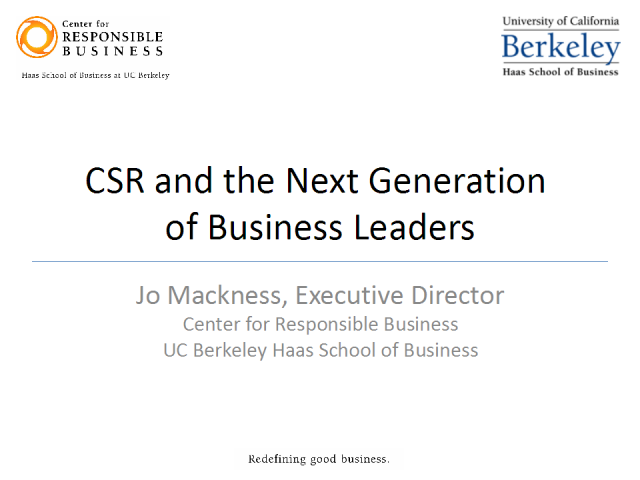 Multiple studies show that consumer expectations around social responsibility are at an all time high. Join Tamara Birdsall, brand consultant, for the latest on how brands are doing well by doing good. The market for carbon, energy, and sustainability management software is crowded and rapidly evolving. 451 Group analyst John Stanley will give a brief overview of the industry, after which a panel of software end-users will discuss their experiences using such tools. Panelists will discuss what carbon and sustainability management software can do, what it can’t do, and what their respective organizations have been able to accomplish with it. The session will wrap up with time for audience Q&A, and you will walk away with a better understanding of the benefits and challenges of tracking and managing corporate sustainability. Bruce Klafter, Senior Director, Environmental Health and Safety, Applied Materials, Inc.
Ben Thompson - Sustainable Business Program Manager, Sustainability Living Lab - Autodesk, Inc.
PANELIST - Becky Brun, Editor, Sustainable Industries Magazine. Micheline Birkhead, MBA. VP of Marketing, CSRware Inc.
A roundtable webcast hosted by Blythe Chorn of Business for Social Responsibility (BSR) discussing the business case for CSR, best practices in reporting and benchmarking, and case studies from a variety of sectors. Sustainability is now considered an economic imperative for businesses, according to the latest BASE Survey Results. The results highlight the need for more clear and consistent governmental policies related to sustainability for businesses. Learn where to start to build a low carbon sustainable business by developing a 50 year vision for your business and what the incentives are to become sustainable. Solitaire Townsend is a leading international voice on communicating sustainability. In 2001 she co-founded Futerra Sustainability Communications Ltd, an agency specialising in behaviour change, sustainable communications strategy and building sustainable brands. A values-based company committed to transformational change, Futerra is a force in the UK, Europe, USA and Asia. Solitaire was named Ethical Entrepreneur of the Year 2008/09 , is a member of the United Nations Taskforce on Sustainable Lifestyles, Board Director of leading think tank Tomorrow’s Company and was appointed as one of fifteen London Leaders for Sustainability. Christopher Broadbent has worked as a journalist, and in public relations. He is now an advisor to business on sustainability. He keeps a foot in the PR door as non executive chairman of Green Row PR, and a non executive director of The Argyll Consultancies. He is a founder partner of BASE; connecting business with sustainability in terms of profit, opportunity and policy. He is the chairman of the advisory board of Green Rewards. He is involved in sustainable landscapes through his pro bono work on the board of the world’s leading flora conservation charity, Plantlife International. With his wife Sarah he runs his own small farm in East Sussex on sustainable principles, becoming a showcase site for biodiversity, conservation and traditional management methods. In this dynamic global business environment it is critical to keep your business on the cutting edge and never miss an opportunity. This channel features webcasts by leading business management and strategy experts to keep you up-to-date with the latest and greatest trends and tactics. Presentations cover best practice advice, proven strategies, corporate social responsibility guidance, and workforce optimization techniques.